1. Preheat the oven to 200°C, gas mark 6. 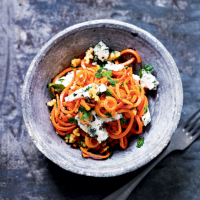 Place the butternut spaghetti on a baking tray and toss with the sage, garlic, walnuts and olive oil. Spread the mixture out over the tray and season well. Roast for 5 minutes. 2. Toss with the parsley and cheese and drizzle a little extra oil. Season and serve.